He may have a car just like James Bond. But its unlikely the famous English spy would ever get himself stuck in a tricky situation like this. 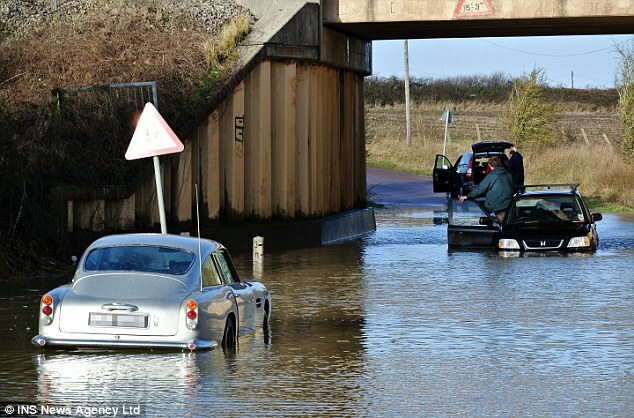 The driver of this £300,000 James Bond-style Aston Martin DB5 was left red-faced today after getting stuck in flooded water in Oxfordshire. It is believed he ignored signs which warned that the road underneath the bridge between Woolstone and Longcot was flooded with up to two feet in water. The £300,000 iconic car was stranded in 2ft of water which was a combination of heavy rain and melting snow from the surrounding hills. The car was famously used as Bond’s gadget-filled car – including an ejector seat – in the 007 film Dr No. However, this silver-grey immaculately restored 1964 model ran into trouble in Brize Norton, Oxfordshire. Christy Bate, 24, snapped the stricken car after she and boyfriend Tom Kennedy came across the flooded road after a visit to the Uffington White Horse. 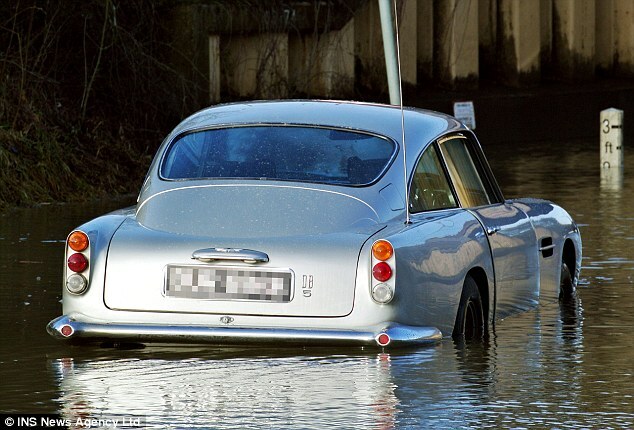 ‘When we saw on the picture it was a DB5 we realised exactly which car had become stuck. ‘I like the Bond films and this car had appeared in the latest movie. The driver of the car was on the side of the road wearing his wellies and then his wife appeared with a 4×4 full of children and dogs to help him out. An RAC truck finally arrived to take the car to a specialist garage. ‘He didn’t looked too fussed by it all,’ said Mr Kennedy. As the DB5 was waiting to be pulled out other cars travelling in the opposite direction tried to drive through the standing water and can to the same sticky end as the 1960s car. Only 1,023 Aston Martin DB5’s were made and this one had been for sale in 2010 and proudly displayed in London’s Westfield shopping centre. The car had undergone a complete restoration and was in mint condition. The unfortunate incident comes after lottery winner Robert Johnson saw his £100,000 Bentley written off when he tried to drive through a flooded road in Tewkesbury, Gloucestershire, early this month. He was driving along a country lane on the outskirts of the town when the black Bentley Continental GT was swamped by three feet of water from a stream which had burst its banks.